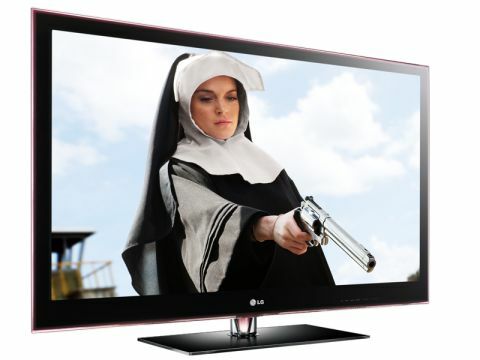 The plasma-powered LG 50PX990 is the UK's first TV with THX 3D certification. This is a big deal, since the Lucasfilm-devised standard's tough criteria demand that 3D images remain bright and natural when viewed through the special glasses and that the shuttering lenses employed to create the three-dimensional effect don't cause synchronisation errors or introduce crosstalk noise. The latter specification by itself should ensure that no LCD 3D TVs bag the same endorsement any time soon. The 3D playback is just a small part of what this set has to offer, however, with other highlights including access to LG's NetCast online platform and a rather attractive single-layer fascia design. Unsurprisingly, the 50PX990 sits right at the top of LG's plasma lineup, joining its 60-inch 60PX990 sibling in being the only 3D-capable plasma sets currently offered by the South Korean brand. You get a similar level of spec minus the 3D with the PK990 series, while the cheaper PK790 range sheds the black level filter found on the more salubrious models. If you'd rather try LG's LCD 3D models, the flagship ones are the LX9900s, which come in 55-inch and 47-inch options and feature direct LED backlighting.